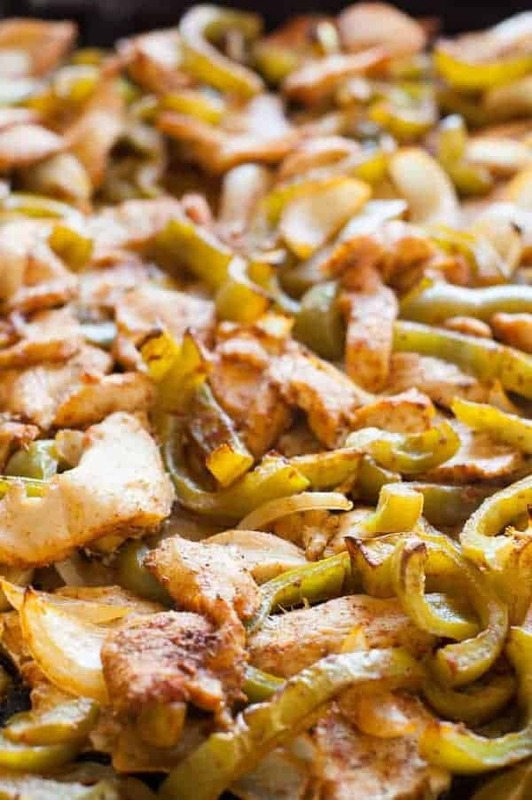 This is the best Clean Eating sheet pan chicken fajitas recipe. This is so easy to make and my oldest daughter actually told me she thought dinner was good the first time I made it. It’s kind of sad it’s mentionable that my daughter told me dinner was good, but she usually just eats dinner and leaves, so the fact that she actually said something means a lot. 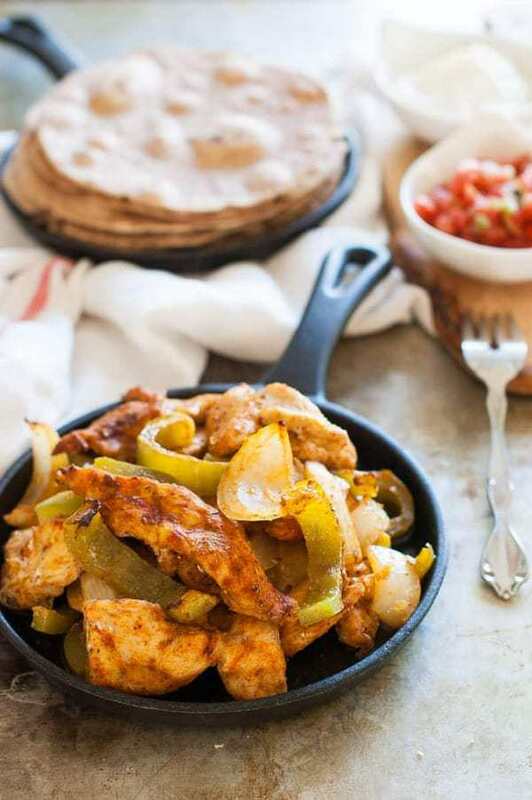 I’m going to tell you right here and now that these are not the most authentic fajitas ever, but what they are is a good, easy and healthy Clean Eating chicken fajita recipe! I don’t like all the work and mess of fajitas. I need something I can prep then help children with homework and not have to worry about the food during homework time. These fit the bill. The first thing I recommend is to make tortillas ahead of time so you don’t have to worry about it during the rush of dinner. Or, you could make them while the fajitas are cooking if you would rather. I also use chicken because I haven’t figured out the right kind of steak and since I don’t eat red meat from regular grocery stores, I can’t afford to feed steak to the whole family. Cilantro and oregano essential oils are so strong that I recommend simply dipping a toothpick in the bottle and swirling it around in the olive oil to infuse it with flavor…even 1 drop can be too much and this way you can control the strength a bit easier. Don’t be afraid to put a lot of paprika and cumin in the marinade. I put a lot on and my children used to be wary of the chicken because it was all red but then they tasted it and you can only taste flavor and not heat so they love fajitas and ask for them a lot. If you do want some heat, I would definitely recommend adding a little red pepper. Something else I do that’s unconventional is I hate messing with filling tortillas, having it drip all over my hands (especially with interruptions from children, etc.) so I just mix all the ingredients together on the plate except the tortilla then break the tortilla over the top so it doesn’t get soggy. It may look gross but I think it tastes the best this way and it’s faster and easier. I dare you to try. . . 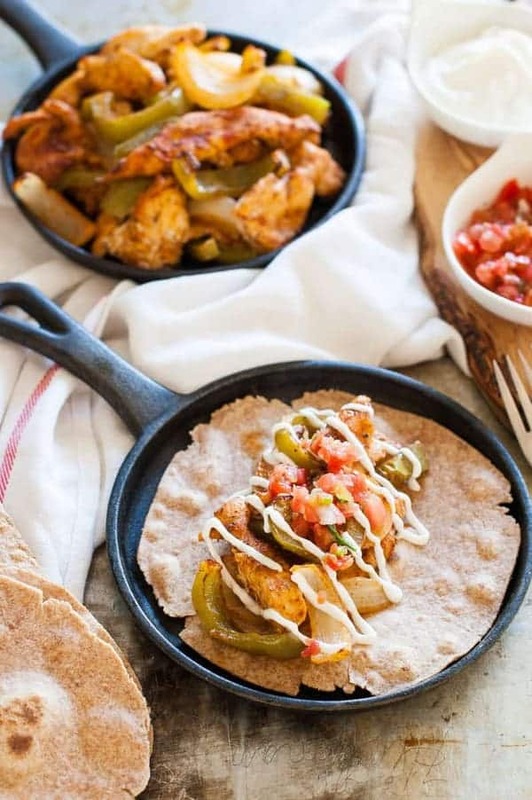 These Clean Eating sheet pan chicken fajitas are so easy to make. I just throw everything in the oven and let it bake while I do homework with my children. In a large bowl, mix together the olive oil and fajita seasoning. Add the chicken and toss to coat. Cover and refrigerate for 2 hours or up to 24 hours. Place the marinated chicken on the baking sheet, as well as the onion and bell pepper. Toss together and spread evenly over the baking sheet. Bake on the top rack of the oven for 25-30 minutes, or until chicken is cooked through. Squeeze the juice from half the lime over top of the chicken and vegetables. Serve on tortillas and top with with lime (if desired), sour cream, salsa, cilantro, and avocado. These are amazing! Really! I am a personal food critic and never like anything I make, but this has made it into our weekly staple meals. It’s so yummy and makes a lot more than you think and so so easy! Thanks !! I think I will love the oven baked fajitas flavored with Essential Oils. These look delicious. I will have to give them a try…. thanks for the recipe!